School Bus Accidents & Injuries | Brunswick Georgia Personal Injury Lawyers – The Dow Firm, P.C. School bus wrecks and injuries can occur in a variety of ways – many of which imperil the lives of children. A child can be injured by a reckless driver illegally passing a school bus when it is stopped and children are attempting to get off or on the bus. A large number of children can be injured if the driver of a car or other vehicle negligently causes an impact with a busload of students. From a different perspective, a child can be injured when the bus driver himself is negligent and causes a wreck or fails to maintain a proper lookout for children who have exited the bus. In fact, third parties not even on the bus can be injured due the dangerous driving of a school bus driver who, in addition to risking harm to his juvenile passengers, endangers other motorists and pedestrians on the road. 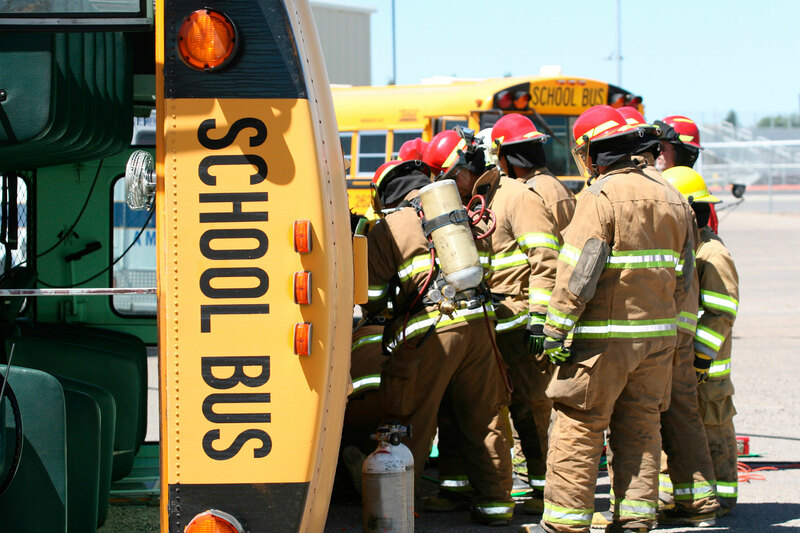 School bus injuries can occur in other, not so apparent, ways as well. For instance, a school bus driver has a duty to maintain order on a bus for the safety of his passengers and other drivers on the roadway. Reciprocally, the passengers on a school bus have an obligation to respect other passengers by not fighting with each other or the bus driver, distracting the bus driver or otherwise creating a dangerous environment in which the bus is operated. Georgia has particularly stringent laws (statutory and case law) which pertain to the safe operation of school buses. Some of the statutes are codified at O.C.G.A. § 40-6-160 et. seq. regarding drivers’ responsibilities while other statutes pertaining to a school board’s obligation to maintain liability insurance for bus-related injuries are found elsewhere in the Georgia Code. The various legal aspects of a school bus case can be complicated and confusing. However, as an advocate for children, The Dow Firm, P.C. has and will continue to vigorously and successfully prosecute any claim involving an injury associated with the operation of a school bus. The stakes are too high to permit acts of negligence involving the transportation of our youth to go unchecked. The Dow Firm, P.C. is proud to offer services and represent clients with school bus crashes and other school transportation claims in Glynn County (Brunswick, Country Club Estate, Dock Junction, Everitt, Jekyll Island, Sea Island, Sterling, St. Simons Island and Thalman), Brantley County (Atkinson, Hickox, Hoboken, Hortense, Lulaton, Nahunta, Trudie and Waynesville), Camden County (Colesburg, Dover Bluff, Harrietts Bluff, Kings Bay Base, Kingsland, St. Marys, Tarboro, Waverly, White Oak and Woodbine), Wayne County (Jesup, Odum and Screven), McIntosh County (Cox, Crescent, Darien, Eulonia, Pine Harbour, Ridgeville, Shellman Bluff, South Newport, Townsend and Valona), Pierce County (Blackshear, Bristol, Mershon, Offerman and Patterson), Chatham County (Bloomingdale, Garden City, Georgetown, Isle of Hope-Dutch Island, Montgomery, Port Wentworth, Pooler, Savannah, Skidaway Island, Thunderbolt, Tybee Island, Whitmarsh Island, Wilmington Island and Vernonburg) and counties throughout the state of Georgia. The Dow Firm, P.C. is located in Brunswick, GA, however, our firm is able to manage school bus crashes and any other type of personal injury case in Georgia.